On the occasion of World Sight Day on October 13th in the Blue Conference Room of the Health Insurance Fund of the Republic of Srpska an expert gathering Retina Day (Prevention of low vision caused by retinal vascular diseases) was organized. 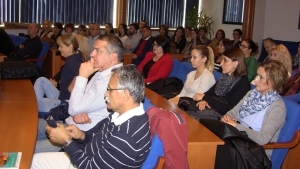 The expert gathering “ Retina Day” was attended by representatives of the Ministry of Health and Social Welfare of the Republic of Srpska, the Health Insurance Fund of the Republic of Srpska, Faculty of Medicine in Banja Luka, University Clinical Centre of the Republic of Srpska, numerous ophthalmologists and representatives of the Association of Patients Suffering from Retinal Vascular Diseases. 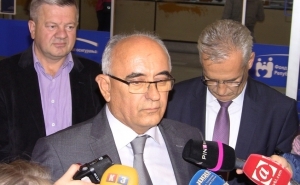 Minister of Health and Social Welfare of the Republic of Srpska, Dragan Bogdanic, MD has warned against progression of diabetic retinopathy emphasizing that the health care system of the RS provides an adequate protection and support in treatment of patients. According to the words of the General Manager of the University Clinical Centre of the Republic of Srpska, Professor Mirko Stanetic, MD, PhD, the Ophthalmology Clinic achieves impressive results and provides services to a large number of patients in the Republic of Srpska. According to his words, achieved results also represent bigger challenges and additional obligations. 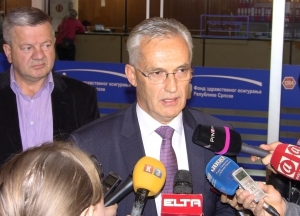 The aim is to relocate the Ophthalmology Clinic as soon as possible to the renovated floor of the Central Medical Block and to continue medical education in order for the Clinic to become centre of excellence for all health care institutions of the Republic of Srpska. Head of the Ophthalmology Clinic of the UCC RS and President of the Association of Ophthalmologists of the RS, Professor Milka Mavija MD, PhD, has indicated that 80 % of eye diseases can be cured. According to her words, there is no accurate data on number of blind and visually impaired people in the Republic of Srpska, therefore one of the aims of this gathering will be creating of the central national registry..